Francis was born in 1883 the second son in the large family of Jesse and Sarah. From their address at Brook Lodge Cottage it seems quite likely that the Habershon family employed Jesse although they later moved to Park Farm. Jesse earned his living as a gardener as did Frederick. Prior to enlisting at Guildford, Frederick appears to have spent his entire life living and working in Holmwood, employed as a gardener in the Knoll Gardens. He was not married. 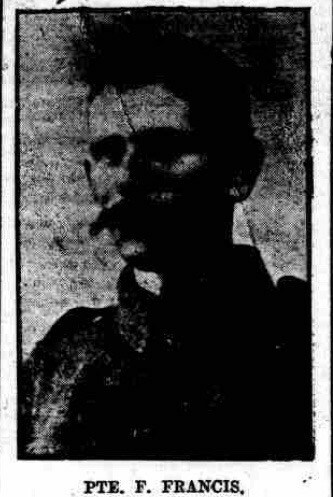 Frederick Francis was killed in action of 25 September 1915, the first day of the battle of Loos. There had been a 4 day artillery barrage attack on the Germans, This was followed up by a chlorine gas attack which unfortunately blew back to the British positions resulting in 2,500 gas casualties of whom only 7 died. After only a few days of sporadic fight the British Forces were forced to retreat. Frederick Francis was aged 33 at the time of his death. He is commemorated at the Loos memorial. His body was never recovered.